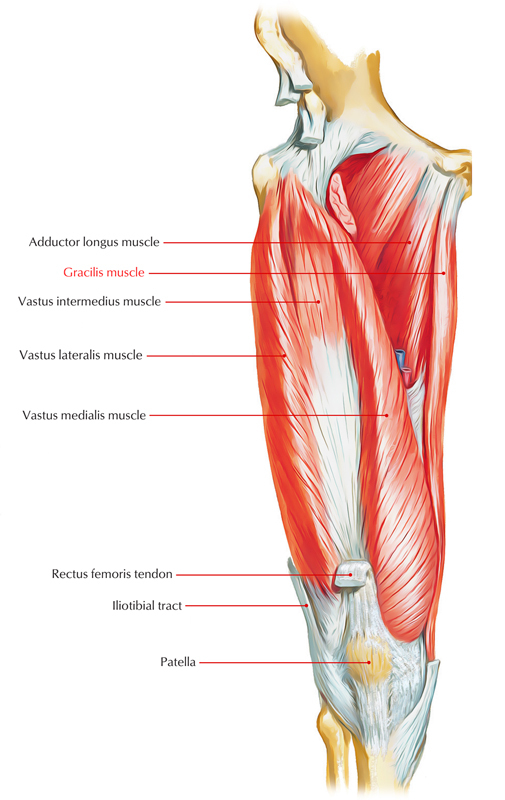 Gracilis is situated on the medial side of the other muscles of the adductor compartment. It is a long thin muscle (G. gracilis = thin) . It’s the only muscle of the adductor compartment that’s not connected to the femur. It originates from the medial margin of the lower half of the body pubis and adjoining anterior part of the inferior pubic ramus. It enters downward vertically on the medial side of thigh to the upper part of the medial surface of tibia, where it’s added between the insertions of sartorius (in front) and semitendinosus (behind). By the anterior section of obturator nerve. It adducts the thigh. Additionally, it’s a flexor of the knee joint and a medial rotator of the leg. The adductor muscles of the thigh have been known jointly as custodes virginitatis (i.e., custodian of virginity). Which muscle of adductor compartment is not connected to femur? Which muscle originates from the medial margin of the lower half of the body pubis and adjoining anterior part of the inferior pubic ramus. Which nerve supplies the Gracilis muscle?